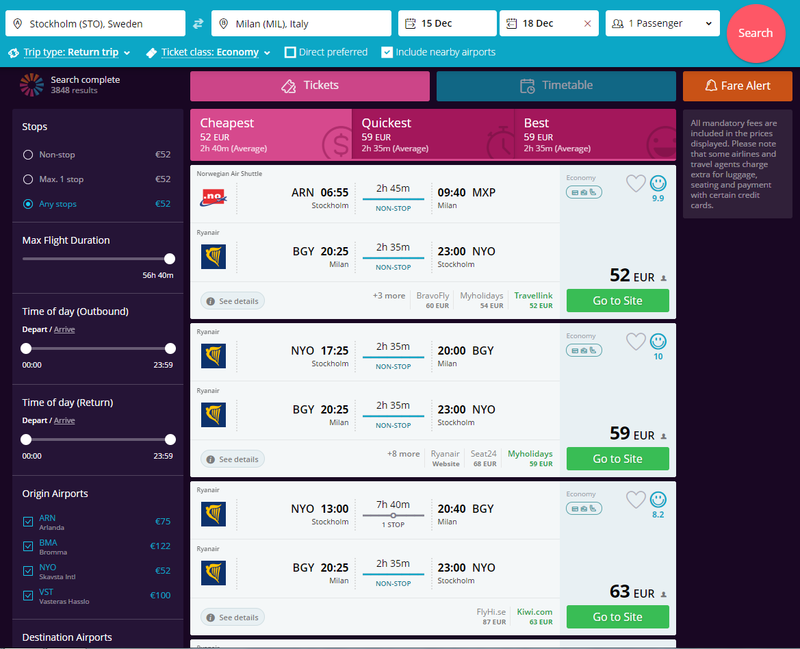 I often notice that Pokémon players tend to get a bit lost when planning out their travels, with many not knowing that there's an easier way to find good flights than checking each and every airline's website, and just as many being unaware that there are cheaper alternatives to paying 35€ a night to stay at a hotel. But never fear! This guide is here to help you out! I'll start off with an example: let's say that I'm interested in attending the Special Event in Turin, Italy, from December 16 – 17. My first order of business would be to figure out the best flight. Make sure you start looking at flights one to two months in advance, if you can! 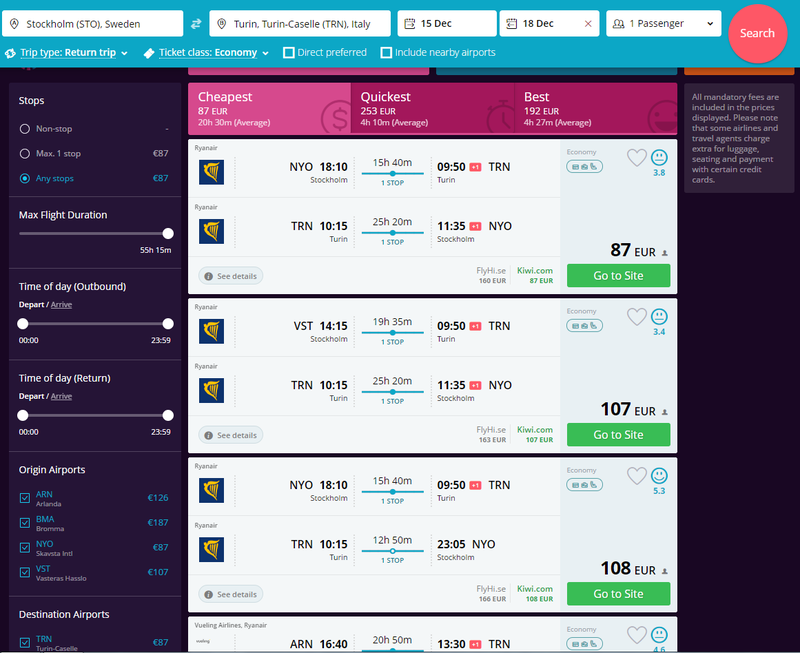 Flight prices tend to ping-pong more and more often as the date of the flight nears. While a bit sneaky, there's an "include nearby airports" box underneath your search. Well, things aren't looking so great, are they? These flights have awfully long layovers, and they're not exactly cheap either. I suppose we could check that nice-looking "direct preferred" box, but uh-oh! Turns out there are no direct flights to Turin from Stockholm on our chosen dates. Don't worry, though, all hope is not yet lost! Let's take a look at what big cities in Italy Turin is close to. Google Maps: ever-useful! Look out for those bolded, important-looking cities! Just what we were looking for – direct flights at a reasonable price! Now, all that's left is figuring out the public transport and finding a place to stay. But you may have some lingering questions on your mind: does the airline I fly with matter? To tell you the truth, no, not really. If you're traveling within Europe, you probably won't spend longer than 2 to 3 hours or so on your flight. Go with whatever's cheapest! So is there anything else you might want to do before booking your flight? Well, there's one thing you could do: give a different flight search engine a whirl. The one I'd recommend is Google Flights; while it won't show you every single available option the way Momondo does, it has a helpful "flight calendar" feature which tells you which days have the cheapest flights for your destination. That's always worth taking a look at! Now, many people's minds will go to hotels and the like when looking for places to stay while traveling, but the truth of the matter is... most hotels aren't cheap. So before you fire up your favorite hotel search engine, whichever one it is, let's take a look at airbnb.com instead. A lot of people are a bit confused about the concept of airbnb, but put simply, it's a website where hosts rent out either rooms in their homes or entire homes/apartments to you; it varies with the host. Not as luxurious as a five- or even four-star hotel, to be sure, but usually quite cheap! First things first: you want to make sure you've got travel partners with you (traveling with others is considerably cheaper, not to mention more fun! ), and you want to know where the tournament is taking place. Staying at a place that's close to the venue is ideal, after all! Copying the information straight from pokemon.com, we learn the Turin Special Event is taking place at Torino Xmas Comics & Games, Lingotto Fiere (Hall 1), Torino, Italy. Let's type the relevant part of that into airbnb's search bar. Looks like there's quite a bit to choose from! We want a good compromise between location and price, so make sure to use the map on the right to find something that's as close to the venue as possible. You can choose a price range as well, if you so wish. The first hit on the list seems like it will make for a fine example for the purposes of this guide, so let's take a closer look at it! Good reviews are always a welcome sight! 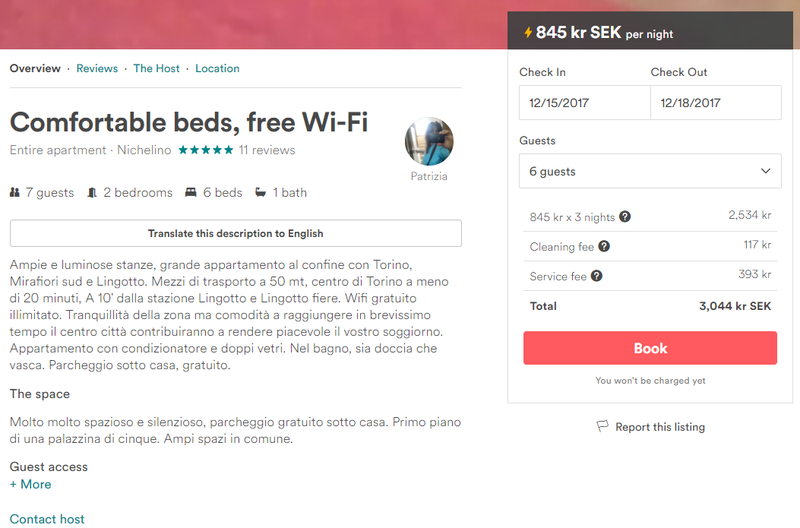 Certain hosts will charge extra for more people, whereas others don't. Many airbnbs (again, not all!) 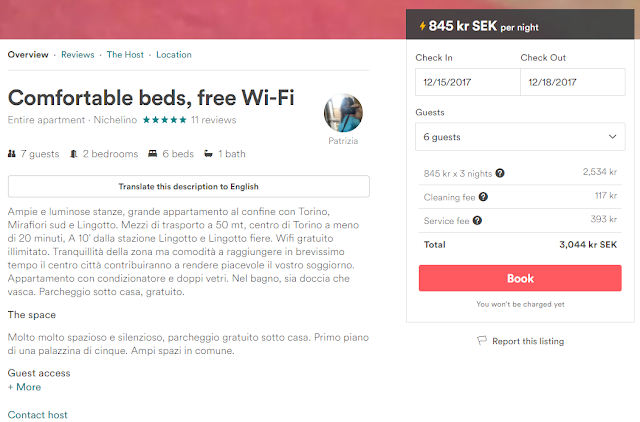 also have a cleaning and service fee tacked on which is not shown when initially searching for homes, so the initial price of 845 SEK (88€) per night is a bit misleading. Still, adding it all up, the price comes out to a 3044 SEK total for all three nights, which when divided by the number of guests – 6, in this case – ends up being 507 SEK (53€) per person. Pretty good price! 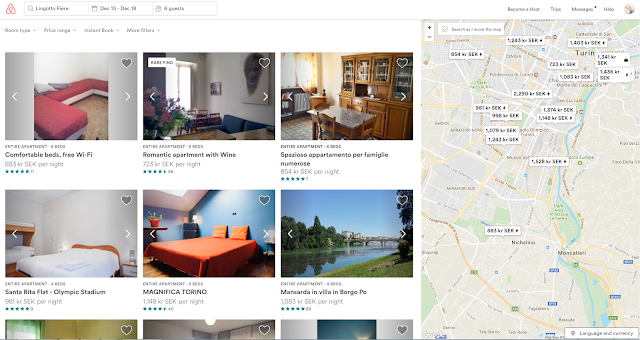 If you don't like what airbnb has to offer or if you're travelling alone, there's always the option of hotels, hostels, or actual BnBs, with the latter two generally being the cheaper options. There are numerous sites for searching through these, but one generally good option is booking.com. The search engine works much in the same way as the others you've seen do, so I'll leave the rest up to you! Here's one final tip: both airbnb and booking.com offer perks in the form of cheaper stays if you can recruit someone else to the site and have them book a place for the first time. Make full use of this if you're traveling with others! And here comes everyone's favorite part: solving the public transport puzzle. Again, this isn't as hard as it may seem, as typing "X to Y" into Google will generally tell you how to reach your destination and/or show you some actually relevant ads. Thanks, Google! I'd like to keep this section a bit shorter than the others: in most cases, you'll want to travel by bus (with some notable companies for Europe being Terravision and Flixbus, as well as National Express in the UK), unless you're in a city with a metro, in which case that will be your preferred option. Trains are yet another choice, but they're usually a bit more expensive. Finally, if you're completely out of luck, there should always be the option of taking a taxi (which may not be such a bad idea if you're traveling with a larger group of people as you can split the cost). 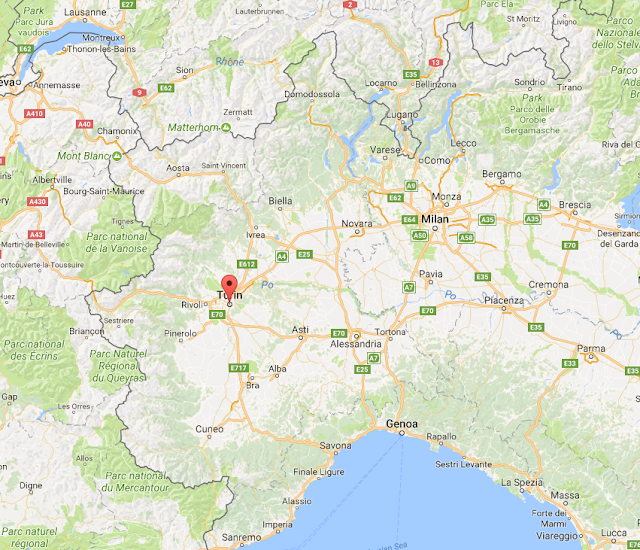 In our case, we're taking a flight to Bergamo airport (located in a city near Milan), going from there to Milan, going from there to Turin, and then finally going from there to whichever place we'll be staying at. 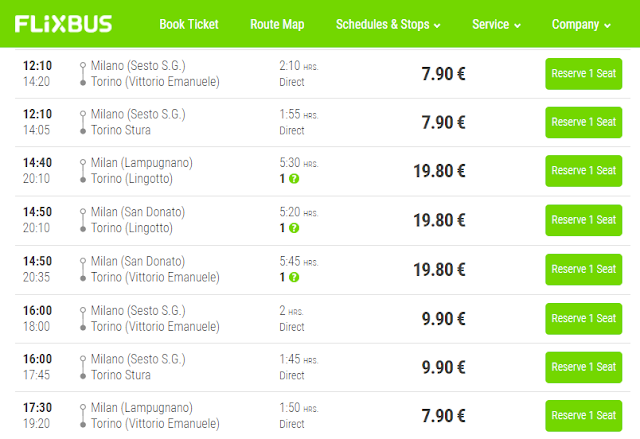 Terravision buses from the airport to Milan cost a very reasonable 5€ from Bergamo and 4€ back, and a Flixbus from Milan to Turin is a little under 8€ one-way. 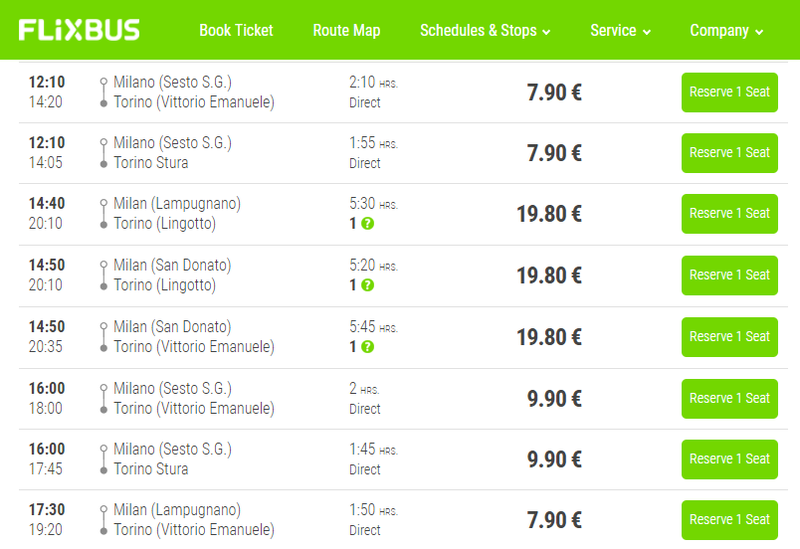 And we're in luck: both Milan and Turin have a metro, so travel within the cities should be no issue! Pretty reasonable, if we ignore those 20€ ones! All in all, we'd pay 52€ for our flight ticket, 53€ for the accommodation, and 25€ for the bus tickets, all for a total of 130€. Not bad!